Gongura is widely consumed all over Andhra Pradesh.Gongura is a very rich source of Iron, vitamins, folic acid and anti-oxidants essential for human nutrition.Similarly, Gongura is popular in Tamil Nadu as well, and is called pulichakeerai in Tamil.Gongura comes in two varieties, green stemmed leaf and red stemmed. 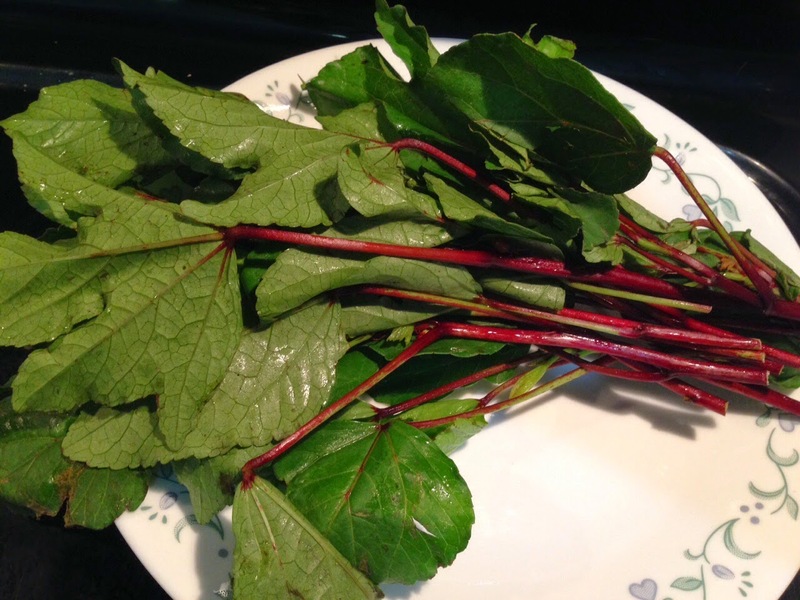 The red stemmed variety is more sour than the green stemmed variety. Other well known recipes made with Gongura as the main ingredient are Gongura Pappu (Lentils),Gongura mamsam (goat/mutton) and Gongura royyalu (shrimp). when one talks about Andhra food Non vegeterian the first thing they would say is Gongura mutton or mamsam.Andhra non vegetarian is incomplete without gongura mutton.It is lip smacking mouth watering dish.There are no words to describe only you have to taste it. Marinate mutton with above ingredients and keep aside for half an hr. As the gongura added to the mutton gives a unique taste in which gravy dominates the mutton.I added less spices compared to the regular mutton as i wanted to enjoy the gongura flavour in the mutton. Small 2 ginger pices and 2 pods of garlic. Grind all into fine paste. Take wide pan add 2 cups of water.Let it boil few mins then add gongura leaves(wash gongura leaves and discard the stem)cover with a lid then cook few mins until the leaves are well cooked.Iadded few chopped onion and2 green chilli in boiling water. Heat oil in a pan add chopped onions 1 cup , fry until they are golden brown.Now add the wet masala paste,fry well until the raw smell goes off. Now add the marinated mutton to the masala paste and fry well in a medium flame, until the masala well absorb the mutton.cover with a lid.This is important step, if we dont fry the mutton well we not able to enjoy the perfect taste. After frying 10 to 15 mins we can see oil oozes out from the curry.Now remove the lid and fry until it is completely dries off. Now we may add water to the curry,add water just enough to cover the curry.Cook until the mutton 80 to 90% cooked. Usually after adding water i shift the mutton in pressure cooker and cook upto 4 to 5 whistles. 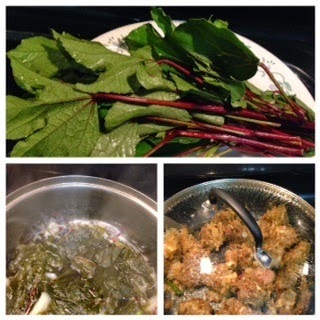 Add gongura paste and cook 5 to 10 mins until the mutton completely absorb green masala paste. 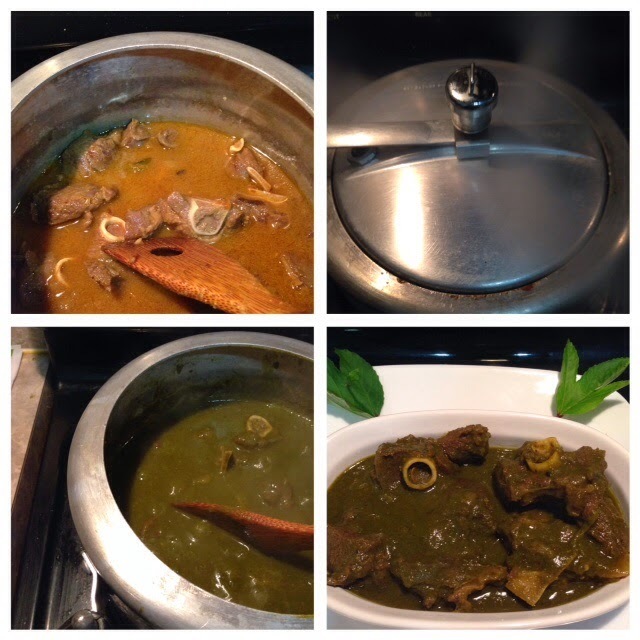 Yummy gongura mutton curry is ready enjoy with rice or roti. 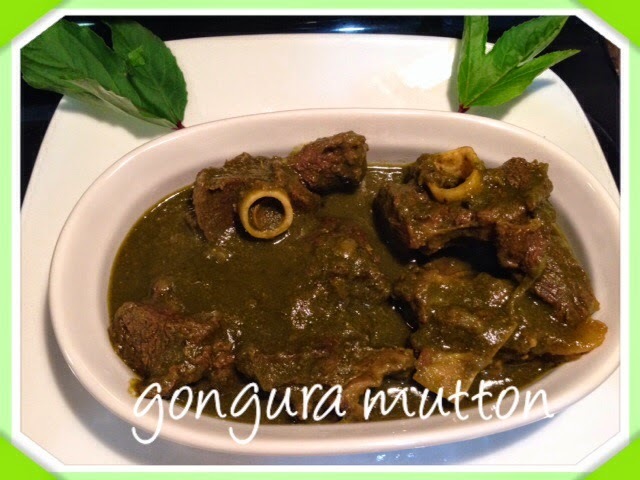 Awesome combination of Gongura flavor to mutton curry, tried this today and came out too good. Thank you.